Here’s it is! 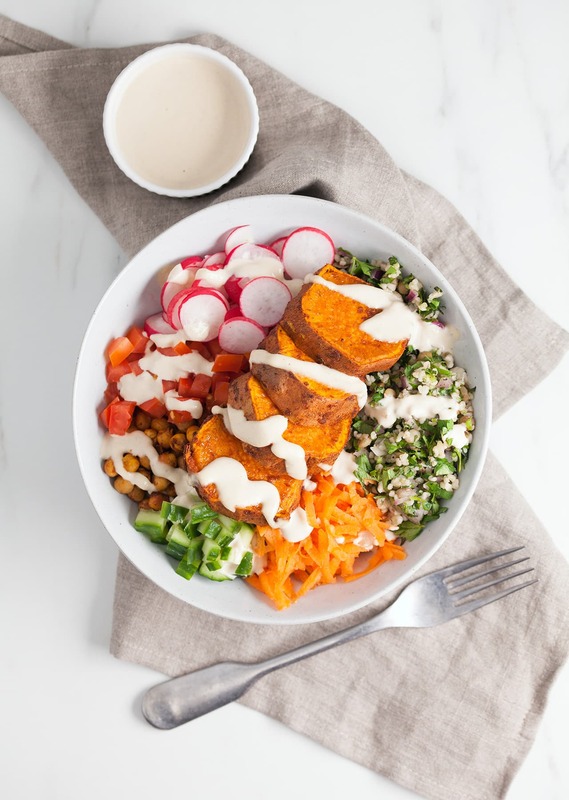 Our brand new sweet potato goodness bowl. Otherwise known as our big bowl of plant-based goodness. This thing is bursting with colour, flavour and wonderfully nutritious plants. We’ve also given this goodness bowl a subtle Middle-Eastern twist, using our take on the classic tabbouleh as the base. It doesn’t get much yummier then this! Preheat the oven to 200°C / 390°F fan-assisted and line a large baking tray with baking paper. Slice the sweet potato into 1cm-thick rings, then drain and rinse the chickpeas. Add both to a large mixing bowl along with the ground cumin, paprika, garlic powder, a drizzle of olive oil, and a pinch of salt and pepper. Mix everything together using your hands, then place the sweet potato rings on the baking tray, followed by the chickpeas. Roast in the oven for 20 minutes. Meanwhile, add the bulgar wheat to a saucepan with 200ml (6.7 fl.oz) of boiling water and a pinch of salt. Bring it to the boil, then cover the saucepan and leave it to simmer for 12-15 minutes until the bulgur is cooked. Pick the mint leaves off their tough stems, roughly chop the leaves and transfer them to a large mixing bowl. Chop the parsley (finely chop the stems), peel and dice the red onion, then add both to the mixing bowl, along with allspice, lentils, lemon juice, extra virgin olive oil, a pinch of salt and pepper, then finally the cooked bulgur. Give everything a good stir, then leave the bowl to one side. Prepare the remaining ingredients by dicing the tomato and cucumber, finely slicing the radishes and grating the carrot. Next, prepare the dressing by combining the tahini, lemon juice and maple syrup in a small bowl along with 3 tbsp of cold water until smooth and fairly runny. Note: if the tahini dressing is too thick and a splash of water but if too runny, add a little more tahini. 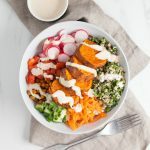 Build each bowl by first adding half of the salad, followed by half of the tomato, cucumber, radishes, carrot, roasted chickpeas and sweet potato. 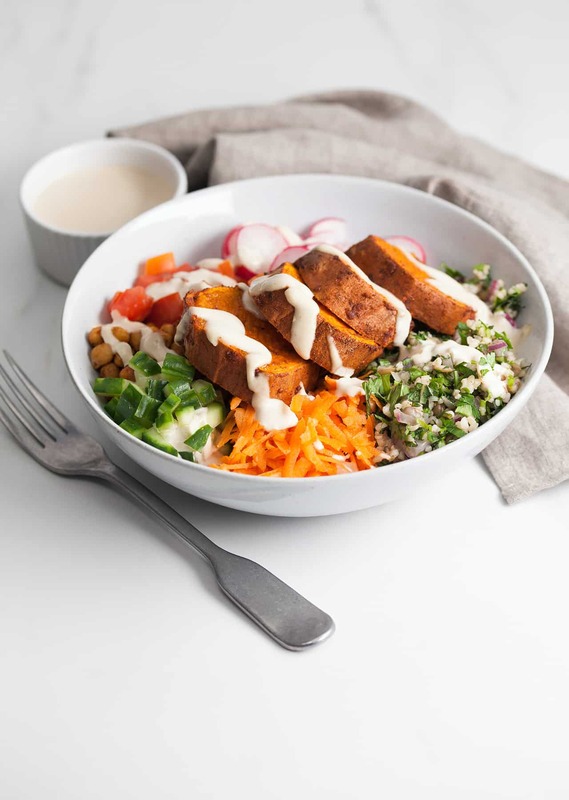 Drizzle with the tahini dressing to serve. Delicious!